Mireya Fernández Chimeno received the M. Sc. and Ph.D. degrees in Electrical Engineering from the Technical University of Catalunya (UPC BarcelonaTech), Spain, in 1990 and 1996, respectively. 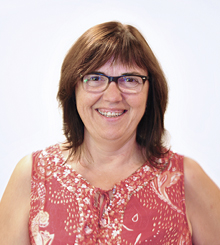 Since 1996 she isAssociate Professor at the Department of Electronic Engineering at the UPC. She belongs to the Biomedical andElectronics Instrumentation Group, where develops her research and is responsible of the Electrical Safety area.She also is member of the Biomedical Engineering Research Center CREB. She is the quality manager of theelectromagnetic compatibility group (GCEM UPC BarcelonaTech ). Mireya is member of the Advisory Board ofHEALTH & SPORTLAB, an spinoff held by Universitat Autònoma de Barcelona (UAB) and Universitat Politècnica deCatalunya (UPC). She was visiting researcher at the Health Sciences Department at the University of York (2003) ,where join the Cochrane Wounds Group. Mireya was Associate Dean (Academic Laboratories) at theTelecommunication Engineering School (ETSETB), (1996-2000), and city councilwoman in Gelida, Barcelona (2007 –2011). She is co-author of more than 100 scientific and academic publications (papers, congress communications andbooks) and 6 patents. Mireya has been involved in 13 research projects in the last 10 years. UPC . Electronic and Biomedical Instrumentation Group. IEB.